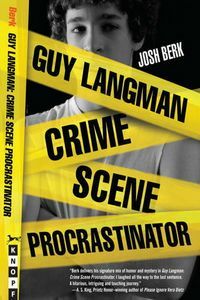 Guy Langman, Crime Scene Procrastinator by Josh Berk: Synopsis and Online Purchase Options. Synopsis (from the publisher): Guy Langman can't be bothered with much. But when his friend Anoop wants Guy to join the forensics club with him in the (possibly misguided) hopes of impressing some girls, Guy thinks why not. They certainly aren't expecting to find a real dead body on the simulated crime scene they're assigned to collect evidence from. But after some girlish, undignified screaming, the two realize it is indeed a body. Which means they have stumbled across a real, dead murder victim.